The Arts Council is still recruiting volunteers to help at the Shoreline Arts Festival on June 23 and 24. Join the veritable army of volunteers who make this great arts event possible and get a glimpse “backstage” as we entertain 10,000+ art-loving community members over two days. Volunteers are needed for a wide range of tasks, with shifts ranging from two hours to all-day, so there’s something for every skill level and any amount of availability. Sign up now on Signup.com! 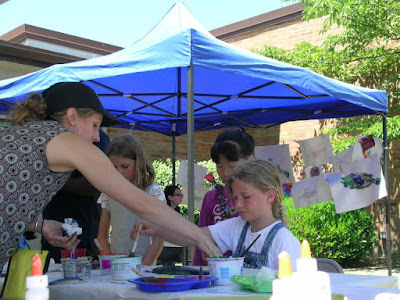 The Shoreline Arts Festival is a free, two-day festival featuring music, dance, theater, art exhibitions, hands-on art activities, cultural rooms, food, and more that is organized by the Shoreline - Lake Forest Park Arts Council. It will be held on June 23 / 24 at the Shoreline Center, 18560 1st Ave NE. Avoid the stress of parking by taking the Free Arts Festival Shuttle. The shuttle will run in a loop stopping at the Shoreline Farmers Market, then Meridian Park Elementary, and end at the Shoreline Center every 20 minutes during festival hours (Saturday, June 23 9:30am-6:30pm and Sunday, June 24 9:30am-5:30pm). Thank you to Shoreline Community College for providing this service. The Shoreline Arts Festival is a program of the Shoreline-Lake Forest Park Arts Council with major support from the City of Shoreline, City of Lake Forest Park, and 4Culture. The Shoreline - Lake Forest Park Arts Council is a 501(c)(3) nonprofit organization whose mission is to cultivate creativity and inspire our community through the arts.